Designed to conform to a wide range of steel post sizes and stay on tight! They are easily installed with or without an adhesive. The bright white color also enhances the visibility of the posts and is cosmetically appealing. 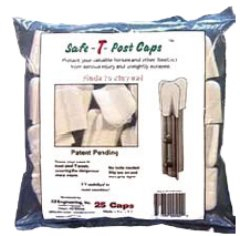 Best of all, Safe-T-Post Caps are economical enough to use in large scale.